Nelson Mandela is 90 years old today. A very Happy Birthday to him. Happy Birthday Nelson Mandela. Amazing man. Also let us not forget de Klerk who freed him and overturned apartheid. Nelson Mandela spent 27 years as a political prisoner in South Africa before becoming the country's first black president. Mandela was a leading member of the African National Congress (ANC), which opposed South Africa's white minority government and its policy of racial separation, known as apartheid. The government outlawed the ANC in 1960. Mandela was captured and jailed in 1962, and in 1964 he was convicted of treason and sentenced to life in prison. Instead of disappearing from view, Mandela became a prison-bound martyr and worldwide symbol of resistance to racism. South African President F.W. de Klerk finally lifted the ban on the ANC and released Mandela in 1990. Mandela used his stature to help dismantle apartheid and form a new multi-racial democracy, and he and de Klerk shared the Nobel Peace Prize in 1993. Mandela was elected the country's president in 1994. He served until 1999, when he was succeeded by his deputy Thabo Mbeki. Mandela's autobiography, Long Walk to Freedom, was published in 1994. 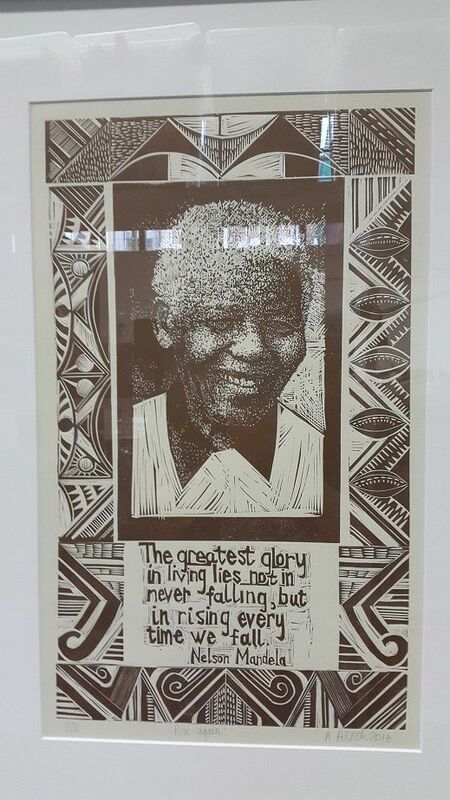 Mandela says in Long Walk to Freedom that he was given the English name "Nelson" by his teacher on his first day at school... Mandela has been married three times: to the former Evelyn Mase from 1944 to 1957, to Winnie Madikizela from 1958 to 1996, and to Graca Machel since 1998... Mandela's wife Winnie became a powerful figure in her own right while Mandela was imprisoned; however, her entanglement in a series of scandals led to the couple's estrangement in 1992, her dismissal from his cabinet in 1995, and their official divorce in 1996. Happy 91st birthday to Mr Mandela. Yeah, Happy Birthday Nelson Mandela! All my neiboors would be white. On a bus I woulden't even be able to meet a black\couloured person. There would be no T.V. And our economy would be a mess! 3 cheers for Nelson! Hip Hip HORAY!!!! He was a truly great leader who wanted all people to have equal rights. Without him, I think there would have been a bloodbath in S.A.
Now, if there is a heaven, he will surely go there. Will he rest in peace? I think he might start organising for equal rights there too. Watch out angels. Sad to hear the news. But what's even worse is today I went to a school for a presentation where they held a moment of silence to mourn his death, yet I noticed several students behaving disgracefully. It's sad how so many people fail to recognize the achievements of persons such as Nelson Mandela. You are right Shivam, people don't realize the true value of a person now a days.But then it is up to us how we respond. Let us change ourselves if not the entire society from today and become an honest and good civilian of the country as well as the world. We cannot give any better tribute than this to him.